Lorenzo de’ Medici continued to use the seven-palli model. An example of its use during the reign of Lorenzo can be found in Botticelli’s Story of Nastagio Degli Onesti, Panels 1 and 3 (1483). The subject work may have been commissioned by Lorenzo for a marriage, which he negotiated between Giannozzo Pucci and Lucrezia Bini. In Panel 3, the Medici device of seven palli (fleur-de-lys at center) is flanked by the Pucci Moor’s Head (left), as well as the Pucci Moor’s Head impaled by the Bini heraldry (right). 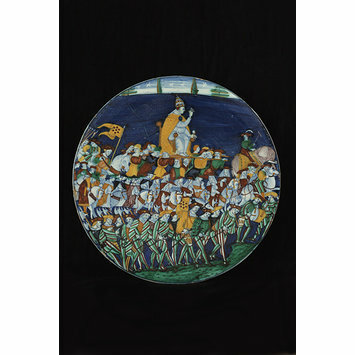 But of particular interest is a maiolica plate (Montelupo, ca. 1516) depicting a Leo X procession. The flags carried by Leo’s soldiers bear the Medici seven-palli device—all red with no fleur-de-lys on a field of blue. Presumably, this is due to size restrictions—restrictions, which would, perforce, apply to the CVI as well. Another issue, which tends to complicate matters is the fact that many Medici supporters purportedly used the device. I would presume, however, that this would not extend to use of the fleur-de-lys, which the French crown granted only to the Medici and their heirs—not the populace of Florence. The same textile repeating the Medicis pattern is on the Chariot immediately below the first rows of the 7 Palles of the Charioter. Now, if my correspondence between the flower motifs of the dress of the female figure of Temperance and the Medicis Palles motif is anything more than mere speculation , this kind of "textile" for women repeating Medicis motifs as ornement could be the allusion present in the very simple dress of Temperance repeating the Stemma in the psChVI Tarot. I, too, commented some time ago on the link made by the CVI between the Chariot and Temperance via the matching, six-petalled, dotted floral motif (with a seventh point at center) or Medici device found on the Chariot’s drapes and Temperance’ gown. The artist’s intent seems clear – nothing particularly speculative about this conclusion. The association between the Chariot and Temperance accords with contemporary convention. Moreover, you’ll note that the CVI, likewise, links the Pope with Fortitude via the same method. That is, each of these trumps exhibits the same, four-petalled floral motif somewhat similar in appearance to a patonce cross on the fabric of their attire. But of particular interest is a maiolica plate (Montelupo, ca. 1516) depicting a Leo X procession. The flags carried by Leo’s soldiers bear the Medici seven-palli device—all red with no fleur-de-lys on a field of blue. Presumably, this is due to size restrictions—restrictions, which would, perforce, apply to the CVI as well." "Another issue, which tends to complicate matters is the fact that many Medici supporters purportedly used the device. I would presume, however, that this would not extend to use of the fleur-de-lys, which the French crown granted only to the Medici and their heirs—not the populace of Florence." "Lorenzo de’ Medici continued to use the seven-palli model. An example of its use during the reign of Lorenzo can be found in Botticelli’s Story of Nastagio Degli Onesti, Panels 1 and 3 (1483). The subject work may have been commissioned by Lorenzo for a marriage, which he negotiated between Giannozzo Pucci and Lucrezia Bini. In Panel 3, the Medici device of seven palli (fleur-de-lys at center) is flanked by the Pucci Moor’s Head (left), as well as the Pucci Moor’s Head impaled by the Bini heraldry (right).
" ... it is tempting to define latest date by reference to use of six palle and fleur dy lyss to 1465 - but not totally reliable, a marriage bedside bench c-1508 between a Medici and Strozzi for example has the seven palle"
You wrote : "I, too, commented some time ago on the link made by the CVI between the Chariot and Temperance via the matching, six-petalled, dotted floral motif (with a seventh point at center) or Medici device found on the Chariot’s drapes and Temperance’ gown. " "Though we cannot be sure of the original dimensions of the textile, it was probably woven as a long border, with a repeating pattern of the Medici device, which may have alternated with other symbolic emblems relating to the family. A valuable textile such as this, specifically woven for the Medici family, would most likely have been reserved for use during important family events, such as marriages, or used on an important piece of furniture, such as the best bed in the household or a canopy covering a ceremonial chair. 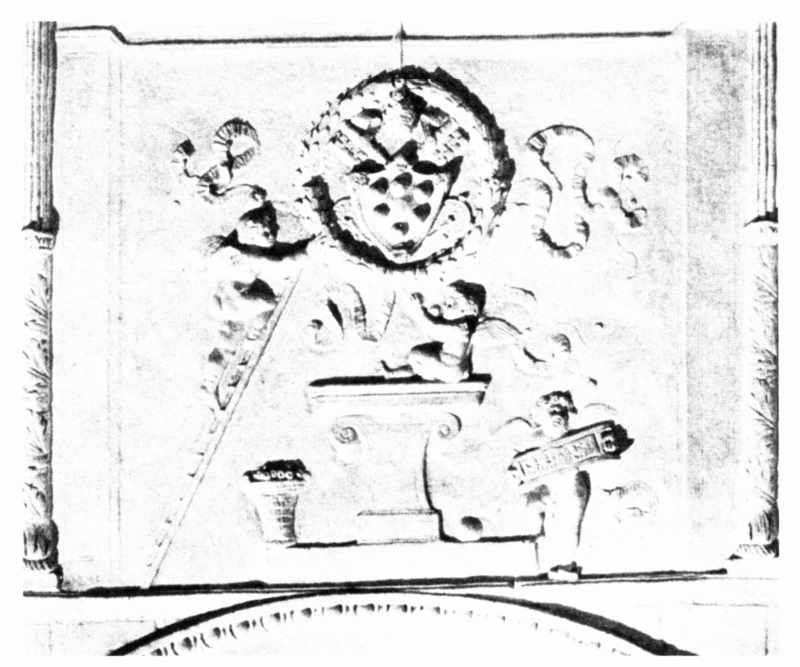 The device of the three feathers encircled by the ring above the motto SEMPER was used to decorate a variety of objects; other examples include a maiolica bowl, horse trappings, and ceremonial headgear"
"Fra' Domenico di Giovanni (Casentino, ... – Firenze, 27 ottobre 1483) è stato un teologo e religioso italiano. Domenicano, priore del Convento di Santa Maria Novella di Firenze, dove visse fino all'età di quasi ottanta anni, fu lettore ed espositore di Dante, provinciale di Toscana, vicario generale dell'Ordine. Le sue esequie si tennero a spese del Comune di Firenze e dello Studio fiorentino, e il Convento di Santa Maria Novella ne fece in lingua latina il necrologio. Scrisse La istoria di Firenze e il Theotokos, poema latino in lode della Vergine, che terminò nel 1468 e dedicò a Piero de' Medici. La prima copia di questo poema fu fatta nel 1471 da Piero di Giovanni Compagni, discepolo di Marsilio Ficino; la seconda copia fu eseguita da Jacopo di Niccolò Cocchi Donati e, nel 1475, esso provvide a donarla alla Libreria d'Ognissanti di Firenze, apponendo la dedica all'inizio del libro: Questo libro, che tracta di Nostra Donna Gloriosissima, e di me scriptore Iacopo di Nicholò di Chocho Donati cittadino fiorentino, istum librum largitus est praefatus Iacobus Nicholai Chochi Librariae S.Salvatoris hac die IV.Oct. 1475. Pro remedio animae suae. Io Iachopo Chochi così affermo. Il poema Theotokos è diviso in quattro libri, più il proemio, dove c'è la dedica a Piero de' Medici. Nel primo libro l'autore parla della vita e della morte della Madre di Dio; nel secondo è esposta la gloria del suo Trionfo; nel terzo c'è un catalogo delle chiese dedicate alla Madonna a Roma e in Toscana; nel quarto vengono citate le chiese dedicate alla Madonna a Firenze e dintorni. Fra queste ultime si trova la Pieve dell'Impruneta e Domenico di Giovanni ricorda monsignor Antonio degli Agli che aveva fatto abbellire e adornare questa chiesa." "The artist’s intent seems clear – nothing particularly speculative about this conclusion. The association between the Chariot and Temperance accords with contemporary convention. Moreover, you’ll note that the CVI, likewise, links the Pope with Fortitude via the same method. That is, each of these trumps exhibits the same, four-petalled floral motif somewhat similar in appearance to a patonce cross on the fabric of their attire. An interesting aspect of this latter association resides—at first glance—in the different use of color. The Pope’s mantel features the conventional blue and gold (the colors identified with St. Peter), whereas, Fortitude’s gown is green with white embroidery. However, closer inspection of the Pope’s mantel near the hem discloses that it is lined with the same green used on Fortitude’s dress. (Cf. PMB Pope.)" Any comments to add ? Néanmoins l'expression 'tarocus" se trouvait en usage dès 1485 ... si ma mémoire ne me fait pas défaut. Puf! I guess, nobody had talked of 1485. I had specifically talked from September 1495, other opinions exist. There are 2 texts, as far I remember. One was published in 1521, the other must have been written before 1499, cause that is the death year of the author. This text has specific information about a conflict at a bridge in Asti ... I relate this to the peace negotiations between French troops and Milan, which took place in September 1495 in Asti. 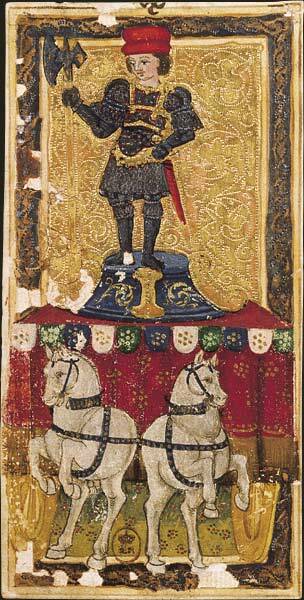 The author amuses himself about the bridge guard, which he calls a "tarocus". 3 months before Italian forces and French troops had their battle at the river Taro. The results were rather negative for the French troops. During the negotiations, which endured a longer time, French troops in very bad conditions were still isolated in Novara. They were released after the peace contract was signed, but on the march from Novara to Asti a lot of them died for exhaustion. The author is known to write macaroni texts, in which words are artfully conversed to Latin ... with funny results. "Tarocus" might be such a word ... in my opinion relating to victims of the battle at the river Taro. Others interpret this with the meaning of Fool. The other author is also a macaroni poet, possibly he replies to the other author - later (according my interpretation). He's from the region of Asti and writes for the French site (the other author was clearly on Milanese site). His dialect is difficult to interpret. Possibly he turns the terminus in something positive. He mentions the name "Ferragu"... that's a most interesting aspect. We had this name recently, in the case you remember. I think, that "Tarocus" is an isolated word, not used by many, in context of the battle. An alternative interpretation is the use of "Tarocch" in wood context (stump of a tree). We persecuted this word. You find the discussions with the help of the local search engine. My memory was 10 years away! 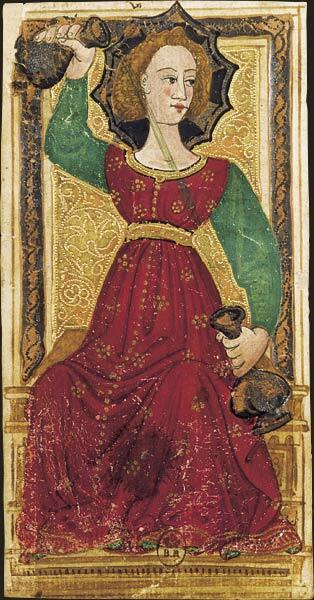 As to the origin of the words "tarot" and "tarocchi" there is also Depaulis 2013 in Le Tarot Revele, as well as Vitali at http://www.associazioneletarot.it/page. ... 20&lng=ENG and other essays linked to there. I have transcribed and translated Depaulis's piece at viewtopic.php?f=11&t=502&p=19407#p19407.